Listen to Michele Ann Kelly sing "Time" by clicking here. music industry insiders as a provocative blend of blues, soul, rock and pop, with a hint of folk and a dash of country. to such esteemed international performers as Dusty Springfield, Shawn Colvin, K d Lang, Alison Krauss and Sarah McLachlan. Her songs are generally autobiographical, giving them a gritty realism sometimes missing in those who write songs based on staid formulae, while making them accessible for the widest audience at home and abroad. Michele Ann Kelly is a perfect example of an Irish artist with considerable international potential. 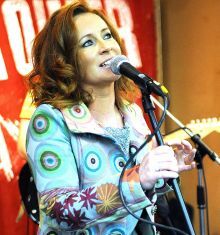 She has supported Mary Black, Paul Brady, Sharon Shannon, Brian Kennedy, Luka Bloom, Jack L, Jesse Cook, Kieran Goss, Mick Hanly and Altan, and has collaborated with established songwriters like, Keith Donald (Moving Hearts), Steve Wickham (The Waterboys), Liam Reilly, Don Baker and Thom Moore. Some highlights on the live front include performing at the Blues Autour de Zinc Festival in France, solo shows at The Sugar Club, Whelan's and Civic Theatre, headlining at Manhattan's Ear Inn in New York and at the 2FM Live Stage Music Show at RDS in Dublin.